Viewing Fantastic Four with fresh set of eyes as 20th Century Fox initiates a new beginning to the film series, instead of following up the previous installment. This time, they introduce a young cast and almost fresh faces and give the viewers the much-needed background as to how they turned into superheroes. The plot starts early in their pre-teens and introduces one of the characters a science fair regular-- Reed Richards, who everyone thinks is crazy with his ideas and inventions. Not losing hope or enthusiasm, he is later discovered by a legitimate institution that builds up inventors. His career and adventure starts as he helps the organization, along with a team of young but brilliant minds, and builds a vehicle that will transport organisms to an unknown dimension. The plot thickens as soon as their team discover that they will no longer be part of the expedition as originally planned. They take matters into their own hands and cause an accident that will change their lives as they know it. The young inventor, Reed Richards is portrayed by Miles Teller. He is best known for his role as Willard Hewitt in the 2011 remake of Footloose. The silver screen emanates that he treats his new superhero role with more artistic maturity and fluidity. Compared to all his other roles, he has clearly become superior in his craft. He stands out from the cast in his own unique way as the slightly clumsy but dedicated nerd who also gets the girl. Although it’s not part of the chapter yet, his relationship with Sue Storm is shown to bloom with short meaningful glances and little stares as they work on their first mission together. The role of Sue is played by Kate Mara from the U.S. TV series, House of Cards. She is introduced as the adopted daughter to Franklin Storm. Her acting talent reminds me a little of Pitch Perfect’s Anna Kendrick but at a slightly lower and more serious tone. Surely, it’s a challenge to play the role of a perfectly obedient and ultimately good person but she pulls through quite effectively. From Steve Montgomery in Chronicles, Michael B. Jordan gives life to the character of the Human Torch. His portrayal feels very emotional since he is introduced as reckless and rebellious but also naturally "smart, hilarious and charismatic," as described by the director Josh Trank. It seems to be a challenge to stand unique among a group of equally powerful characters but portrayal is fired up just like his character. Ben Grimm seems to stay away from the limelight and stays in the sidelines as Reed’s supportive best friend. Jamie Bell was given less amount of exposure than the others but his friendship with Reed has been established. Ben’s character also showed a lot of emotions, though given a few lines. Kudos to him. However, his acting skills are given another block of difficulty when he was all covered in rocks. The computer edits have done all the acting and only a giant man’s acting voice continues the portrayal. To be honest, Victor von Doom’s mysterious character lacked in emotion. Another challenge to the actor’s covered face. Though his eyes are exposed, I think it needed just a little bit more revelation of his anger. His killing spree scene was morbid but probably needed to show his rage but for me, I think it needed more emotion. It felt toned down for the benefit of expanding the audience range. Reg E. Cathey’s fatherly role as Dr. Franklin Storm is beyond acceptable--he’s really good! His representation of the character is theatrically real that his genuine care and leadership transcends through the screen. The lead cast seem to gel quite well once they were all taken back to alternate universe that gave them all their powers. They were successfully able to use their powers to fight against the villain, Doctor Doom. My mind’s eye squinted at the thought. Everything was predictable, even without seeing the previous Fantastic Four movie with Ioan Gruffudd, Jessica Alba, Chris Evans, and Michael Chiklis. I strive to view each film with a fresh set of eyes without comparing them with other movies, especially a reboot like this one. Predictability of the storyline was easily pronounced from the beginning. Every turn is an impending twist that also makes you feel how the result will turn out. 20th Century Fox aimed it at a younger audience. Since the target audience is a younger generation--a.k.a. today’s pre-teens and teens, the cinematography did not require intricate details and up close shots. Everything was shown at a distant perspective that will be easily understood by this age group. Although it can surely be appreciated by all ages, some might get bored because cinematography is down played and have no affliction towards better angles. Another factor to consider is the presence of computer-generated imagery. Acting and cinematography challenges and difficulties are at higher scale because post-production editing need to be considered. Although, we don’t expect anything less. In fact, we know presuppose that movies with CGI have better, more realistic special effects, Avengers’ style. The film in its entirety is dark, not only the backdrop but even the foreground. Actors’ faces are poorly lit except when location, like the Science Fair scene, provides lighting. Although, the director might want to send a message of danger or caution, not all scenes should be that dark. I believe the music of a movie is successful when I don’t notice it at all but ushers me through the flows of emotions and events of the film. I barely noticed any music, and I let that out as compliment. Congratulations to the musical directors, Marco Beltrami and Philip Glass. They have applied small pieces of unnoticeable soundtrack into the storyline that added an eerie and mysterious vibe. Exactly what the director would like to impart to the audience. Despite the controversy between Josh Trank and 20th Century Fox, I still think quality of direction is quite mediocre. Still, they managed to create and complete a movie that will be seen all throughout the world, which is no small feat. Camaraderie is the dominant message of the movie, which they were able to deliver well. It all centers in teamwork and brotherhood. Whenever they act according to this, their plans and missions succeed. It’s always a good reminder, especially to this young generation that we cannot live and succeed alone. 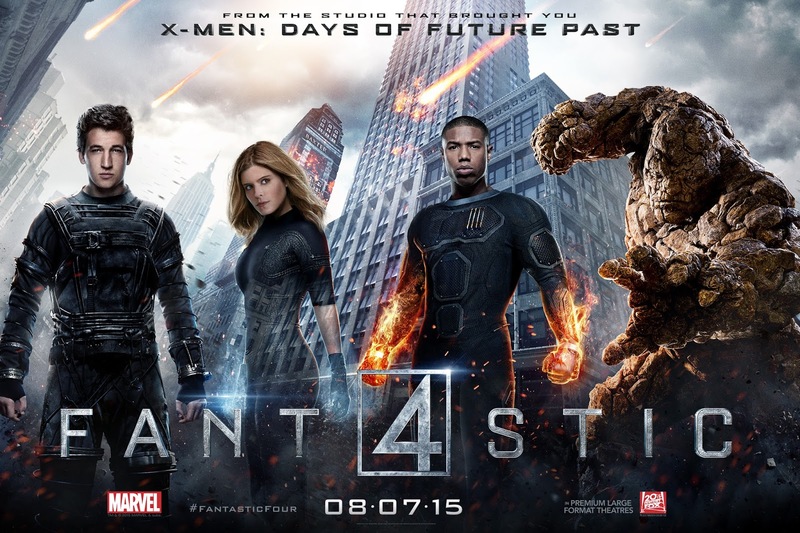 Fantastic Four 2015 is a good way to start the franchise but it can surely do a lot better. The actors have done a great job to make it all believable and so did editing. They achieved their goal to deliver the story clearly and simply. It’s always safe to watch with them and explain negative events but it will surely keep your pre-teens and teens busy and give them something to talk about, new characters to portray during their playtime. Ultimately, it was entertaining.